If you’re living with a partner who snores then you are well aware of the sleepless nights that you endure while your partner sleeps on totally oblivious to your frustration of not being able to get a good night sleep. And then they wonder why you are grumpy in the mornings. I am one of those who snore much to the frustration of anyone who happens to be anywhere near me when they are trying to get to sleep. But I do feel their pain and try to take steps such as putting a pillow at my back so that I stay on my side for the night. This does seem to work, sort of. Well it’s a condition bought on by the narrowing of the nasal passage. When the respiratory passageway in your throat is narrowed, snoring results when you breathe in prompting the soft palate and airway walls to tremble. Various things can cause this. Often, pregnant women start to snore as the pregnancy goes along. There are other people who develop a snoring problem as they age, or after an accident. You will want to speak to your doctor to rule out sleep apnea. This is a relatively critical problem; your respiratory passageways close completely for a couple of seconds so you actually stop breathing. Sleep apnea is connected to serious problems such as heart disease and stroke. Many snoring solutions won’t work if you’re not getting to the source of the problem. For example nasal strips are a quite popular remedy but, because not many people really snore because of nasal problems, they are generally ineffective in most sufferers. Another product available keeps your lower jaw projected slightly forward. This draws the tongue forward thus opening the airway. Should your problem be the result of nasal issues, this device might be helpful; although, many people cannot sleep with anything in their mouth. This makes it unlikely that they will continue to use it. Another anti snoring product is a type of plaster, made to keep your mouth closed. A snorer testing out this product said that it in fact decreased his snoring, but just because he was not able to fall asleep with the plaster on his face. Hardly a long term solution! One possible snoring solution still in its analysis period is a singing DVD. The thought is that as you sing, you are strengthening your mouth muscles and this may assist in alleviating your snoring. The DVD makers also encourage you to lose weight and exercise more. Those individuals who did all three steps did notice an improvement in the sound levels and extent of their snoring. Many doctors promote losing weight and exercising frequently as a great way to improve your sleep. If your snoring is producing a lot of sleepless nights, talk with your doctor or dentist and ask for an appointment with an ENT (ear, nose and throat) specialist. These consultants will set up a series of tests to diagnose the problem behind your snoring and will then assist you in choosing some snoring solutions to determine what works for you. There are a few solutions available that will definitely help to fix the problem. One of these solutions that has a lot of good reviews, are the Anti-Snore Nose Vents. 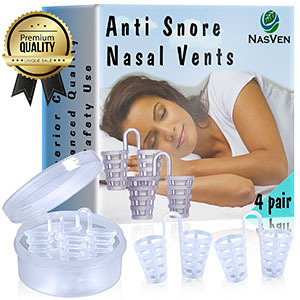 The anti-snore Nasal Vents are made of enhanced Medical Grade Silicone which makes them comfortable to use. The vents are designed to maximise the airflow through your nasal passage. Expanding the airflow stops any obstruction in the throat which is what causes that horrendous snoring sound that devastates sleep patterns and almost causes divorce. So they are definitely worth trying. 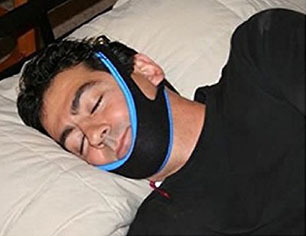 Another Anti-Snoring solution is the My Snoring Solution, Stop Snoring Jaw Strap. The My Snoring Solution jaw strap helps to stop your snoring by aligning your jaw, creating optimal airflow. The strap is comfortable and safe to use. 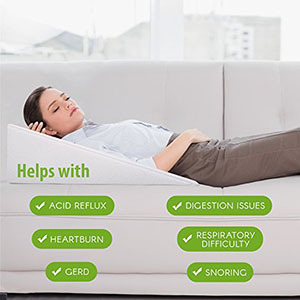 This bed wedge pillow not only helps with your snoring problem it also helps if you suffer from acid reflux when you are lying down. It’s made from high density memory foam which moulds to the contours of your shoulders, nec and head. You upper back and shoulders are supported giving you a better sleeping position. So give these things a try to find our which suits you best. Your family and friends will love you for it, and divorce will no longer be on the cards.